Ibn Battuta's record of his visit to Ceylon in 1344 is one of the rare sources of unbiased literary record describing the rulers and life in Ceylon during that period. He had been a guest of the Jaffna king and is, therefore, a valuable source of information available about this kingdom. During the medieval period, before the European colonizers began their voyages in search of riches, three famous medieval travelers traveled in the Indian Ocean and the East. All three travelers visited Sri Lanka and left records of their visit. First of them is Marco Polo, who traveled from Venice during the late thirteenth century, and left a valuable account of the life and rule of the last Tamil Kings of Tamil Nadu. Ibn Battuta traveled in the mid fourteenth century and his experience in Ceylon is described in detail below. In Ceylon, Ibn Battuta was a guest of the Jaffna King. Admiral Zheng traveled during the early years of the 15th century, at the head of a Chinese delegation comprising 20,000 sailors. He is known to have taken a Ceylonese King as prisoner. A trilingual ( Chinese, Tamil, Arabic) inscription installed by Zhen was discovered in Galle, Sri Lanka by a British Colonial Engineer in 1911. 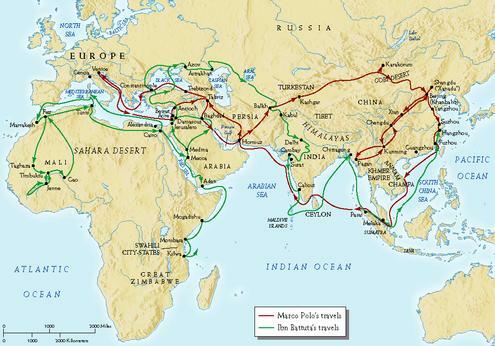 When Ibn Battuta traveled in the fourteenth century Muslim rule had been spread over a large part of India, the Middle East and North Africa and had established a footing in China. 'Arab merchants were everywhere and ships were never long in demand for voyages from any one port to another.' Ibn Battuta is the greatest Arab traveler of the Medieval times. He traveled East from his home country Morocco, zigzagging his way across Africa to Egypt and to India and China using all forms of transport then available, traveling on the back of Camels, in ox wagons, riding on mules and horses and boarding junks, dhows and rafts, and at times he walked. He was employed as a judge and ambassador by several of the Muslim rulers he visited. Leaving his native city Tangier in 1325, at the age of twenty-one, he traveled to East Africa, Byzantium, Iraq, Southern Russia, India, Ceylon, and China for 29 years, covering 120 thousand kilometers, getting as far north as the Volga, as far East as China and as far South as Tanzania. In India Ibn Battuta became the chief judge (Qadi) of Delhi under the patronage of Muhammed bin Tughlaq, served in the courts of the king of Calicut, married into the royal family in the Maldives, and went on a pilgrimage to Adam's Peak in Ceylon. He was a guest of the Jaffna King Marthanda Singai Aryan Pararajasegaram ( Arya Chakravarty) circa 1344. In 1341 Ibn Battuta was appointed by the Delhi Sultan to lead a diplomatic mission to the court of the Mongol emperor of China. The delegation reached Cambay in Gujarat by land and sailed to Calicut in Kerala where the mission ended as a result of shipwreck. He traveled to Maldives from Calicut on his own and spent nine months on that island. Appointed chief judge and marrying into the royal family, he became embroiled in local politics, and ended up leaving after becoming unpopular by imposing strict judgments in the island kingdom. He left Maldives for India with the intention of getting help from Indian Sultans to topple the Malidivian government. However, the ship he was travelling in was forced to land in Ceylon as a result of a gale and change of wind direction. In Ceylon, he landed in Puthalam which was part of the then Jaffna kingdom. The king helped him make a pilgrimage to Adam's Peak. Setting sail from Ceylon to Tamil Nadu coast , his ship nearly sank in a storm. The ruling Sultan of Madurai was related to Ibn Battuta by his earlier marriage in Delhi. Ibn Battuta once again worked his way back to Calicut, from where he sailed to the Maldives again before getting on board a Chinese junk and trying once again to get to China. This time he succeeded. Returning to Calicut from China, he decided to carry on to Mecca. From there he returned home to Morocco via Damascus. Ibn Battuta reached Ceylon during the first week of September 1344 near Puttalam (Batthalah). Puttalam was under rule of the Jaffna Kings, the Arya Chakravrthys, at that time. Ibn Battuta described Chilaw (Bender Selawat) as the first little town after leaving 'Menar Mendely a fine town, situated at the extremity of the Jaffna King's territory...'. Ibn Battuta has also recorded that pearl fishing was in progress at Puttalam and the king gave him some pearls. That explains the reason for the king's presence in Puttalam. The pearls were one of the main revenue earners for the king's coffers. Ibn Battuta also found that the Jaffna King had a powerful navy. When Ibn Battuta identified himself as the brother-in-law and friend of the 'Sultan of Coromondal' (the Madurai Sultan) he was well received by the Jaffna King, who conversed with him in Persian. In addition to the protection of pearl fishing, deterring any possible Islamic invasion from India might have been the reasons for the powerful navy maintained by the Jaffna King. Ibn Battuta went on a pilgrimage to Adam's Peak from Puttalam. The king gave him a palanquin and sent yogis, Brahmins and other men to accompany him and fifteen men to carry things. Ibn Battuta travelled via Chilaw and reached Kurunagala (Konakar), which he described as the seat of power of the principal sovereign of the Island. 'Konakar' may be the Arabised version of 'Kurunakal,' the Tamil version of Kurunagala. 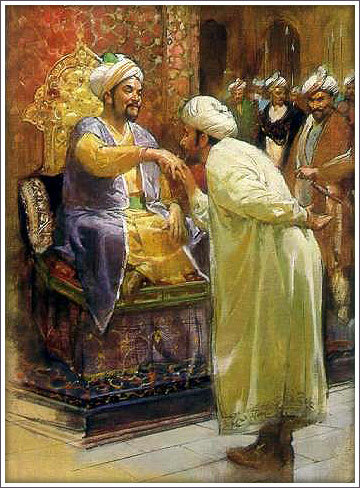 The Ruler is refered to as 'Konar' by Ibn Battuta. This Konar probably is Alagakkonar, who belonged to a powerful South Indian family. Ibn Battuta reached Adam's Peak traveling via the hilly part of the country and discovered that gems are found in abundance in this part of the island. From Adam's Peak he took a southern route to Dondra (Dinewar), a southern coastal town where he found a Hindu temple which had a gold statue of the size of a man with eyes fashioned by two large rubies. (This may be the same temple Admiral Zheng Hee'strilingual inscription refers to and which was later pillaged and destroyed by the Portuguese.) From there he went to Galle (Qali), thence to Colombo ( Calenbu) and from there back to Puttalam. From here he sailed to the Tamil Nadu coast. A few years after Ibn Battuta's return to Tangiers, the Sultan of Morocco commissioned a young writer, Ibn Juzayy, who had enjoyed Ibn Battuta's tales, to record the traveler's memoirs. The result was the book 'A Gift To Those Who Contemplate The Wonders of Cities and The Marvels of Traveling,' or 'Travels' (Rihalah) for short. His account of that journey provides vivid details of his visit to Ceylon, on the Sultanates of Delhi and the Maldives, and on the Islamic conquest of the last Madurai Pandian Kingdom. He also left details of the Hindu Kingdoms on the Western Coast of India. Ibn Battuta's book had a steady readership over the centuries in the Muslim world. European orientalists had heard of the' Travels' by about 1800. An abridged Arabic version done in 17th century was translated into English by Reverend Samuel Lee and published in 1829. In the following years, several full texts having been found, it was edited and published in four volumes by Defremery an Sangunetti in Paris. A translation into English was commenced by H A R Gibbs in 1929, who completed the first three volumes. The translation of volume 4 was completed by H A R Gibbs and C F Beckingham in 1994. The Ceylon branch of the Royal Asiatic Society translated the portion of Ibn Battutah's travels in the Maldives and Ceylon from the French translation of the same original Arabic version into English in 1882. Ibn Battuta traveled during a period when other mobile and well-connected Muslim scholars were traveling in Asia, the Near East and Africa. Any fabrication of his adventure would, sooner or later, have been ripped apart. He knew this, and his audience knew he knew it. Ibn Battuta's record of his visit to Ceylon in 1344 is one of the rare sources of unbiased literary record describing the rulers and life in Ceylon during that period. He had been a guest of the Jaffna king and is, therefore, a valuable source of information available about this kingdom. In the appendix I have reproduced an excerpt from the 1882 translation of Ibn Battuta's book by the Ceylon Branch of the Royal Asiatic Society. Though the reliability of this translation is questionable it stacks up well against the translation in 1994 by GAR Gibb and C Bechingham from the original Arabic version. Those wishing to refer to an accurate translation must refer to this publication. Gray A ;Ibn Battuta in The Maldives and Ceylon Translated from the French of M M Defremery and sanguinetti- Journal of the Ceylon Branch of the Royal Asiatic Society 1982 Extra number. Albert Gray translated only the the Maldivian and Ceylon leg of Ibn Battuta's journey, for the Ceylon Branch of the Royal Asiatic Society in 1882, from the French translation by Defremery and Sanguinetti of Ibn Battuta's 'Travels'. Reference should be made to the 1994 translation by GAR Gibb and C E Beckingham for a more accurate translation directly from the Arabic original. An excerpt from the translation by Albert Gray is appended below. The words within brackets are mine. When I entered the presence of the idolater Sultan, he rose and made me sit by his side, and spoke to me with the greatest good will. “Let your comrades” said he, “land in all safety, and be my guests until they leave. There is an alliance between me and the Sultan of Coromondel (Madurai Sultan).” Then he gave orders to have me lodged, and I remained with him for three days, in great consideration which increased every day. He understood the Persian tongue, and much did he relish all I told him of foreign king and countries. I entered his presence one day when he had by him a quantity of pearls, which has been brought from the fisheries in his dominions. The servants of the prince were sorting the precious from those which were not so. He said to me, “ Have you seen the pearl fishery in the country whence we have come?' “Yes”, I answered, “ I have seen it in the island of Keis, and in that of Kech, which belong to Ibn Assaouamely.” “I have heard of them,” replied he; and then took some pearls and added “ Are there at that island any pearls equal to these?” I said, “ I have seen none so good.” My answer pleased him, and he said, “They are yours: do not blush,” added he, “and ask of me anything you desire.” I replied, “I have no other desire, since I have arrived, but to visit the illustrious foot of Adam.” The people of the country call the first man baba (father) and Eve, mama(Mother). “That is easy enough,” answered he, “We shall send some one to conduct you.” “That is what I wish,” said I, and then added, “ The vessel in which I have come will go in safety to Ma'bar( Tamil Nadu coast) and on my return, you will send me in your ships.” “By all means” said he.